The maker of this firanghi has created a pleasing visual contrast on the hilt by framing panels of wootz steel with ornamented gold borders. This gold decoration has been executed by an expert’s hand and one can make out many details: small quatrefoils are linked by leaves and stems; while the larger flowers, anthemions, can be seen on the knucklebow and the architectural blade straps. The flowers reflects a natural Mughal style. The pommel, worn in places, has a prominent stalk for the wielder’s second hand to grasp and this too has gold decorations: squares and zigzags that lead towards a ball finial. 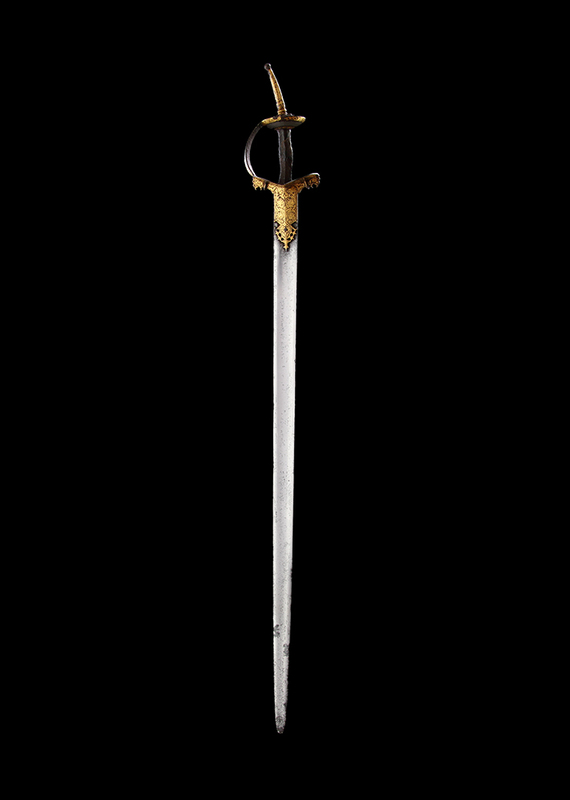 The blade, from which the firanghi (or, foreign) takes its name, is of European origin and is double-edged, fullered and of a length that makes it viable as a cavalryman’s weapon. The steel is tough yet flexible, making it less likely to break when put through the many rigours of 18th century combat. For reference, Robert Elgood shows a shield, possibly from Alwar, in the book Arms & Armour at the Jaipur Court that has similar gold work. R. Elgood, Arms & Armour at the Jaipur Court: The Royal Collection, Niyogi Books, 2015, p.165, cat.no.117.